I had originally wanted to use my Sophie the Bunny plates for Easter this year and planned a beautiful table setting. However, they are stored in The Mansion and there are still not only tall drifts in front of the house, they have crusted over due to rainfall and melting. So, it’s almost bulletproof and very slick. So, I had to make do with what I had that I thought was appropriate. This certainly is not the table setting I wanted, but it’s what I had on hand. 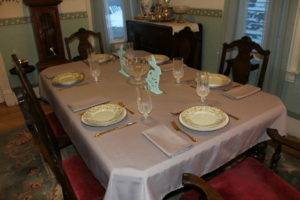 I used the grey Smithson table cloth with matching napkins (Herberger’s) as the base, and my antique Nippon dinner plates (thrift store) for the entrée. Phoebe salad plates (Pier 1 Imports) served as the dessert plate, but I have them in the table setting as the salad plate. Flatware was Royal Golden Plume by Wm. Rogers and Son (antique store in Uptown Butte, Montana), and Longchamp water goblets by Cristal d’Arques (thrift store) finished the covers. The matching Longchamp bowl (thrift store) is flanked by two cut out Jadeite green bunnies to celebrate the season (Walmart). I am not excited about the centerpiece, but it’s all I had on hand to remind us of the holiday.